To say I’ve developed a love-hate relationship with this cigar would be too extreme. It’s more aptly described as severely irritated-very pleased. You see, I’ve smoked half of the ten cigars in the box I bought late last year. Four of them have had construction issues. Two had poor draws, one so tight I could barely smoke it. One had a fairly significant tunnel through about half the cigar, while the wrapper on another began to unravel less than a third of the way into the stick. One of the five smoked just fine. All were tasty cigars, the kind of complex, balanced smokes I’ve experienced before from Casa Fernandez and its showcase Aganorsa tobacco. But it is hard to truly enjoy a cigar when you’re dealing with such interference. As for what happened, I can only guess. I don’t believe my storage was the cause because nothing has changed in my humidor, and I haven’t encountered similar problems with other cigars. I don’t recall problems smoking other Casa Fernandez lines, so I find it hard to believe it’s an endemic situation. No, I think I was just unlucky. Cigars, despite the best efforts at quality control, sometimes simply don’t measure up. In my case, I think I just ended up with a bad box, nothing more. Perhaps I’ll be fortunate and find the remaining five all perform perfectly. 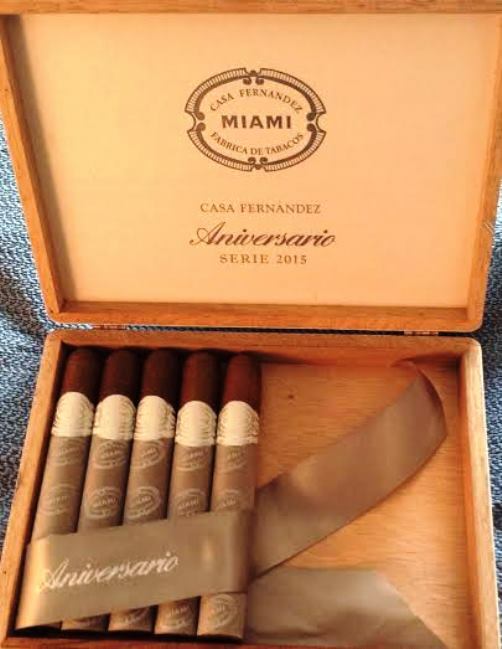 As for the flavors, the Aniversario Miami 2015 Corojo Toro (6 x 56) is excellent. Pepper is dominant at the start, though it quickly goes to the background as a rich, thick sweetness moves to the front. Along the way I encountered roasted nuts, floral notes, and wood. The wrapper is an Aganorsa Corojo ’99 with Nicaraguan filler. The cigar retails for about $12 a stick, a bit less by the box. Obviously, it’s difficult to rate a cigar after so many problems. I considered waiting until I had smoked them all, but would it really matter if it ended up 5-5 or 6-4 or 4-6? The bottom line is that I liked the flavors of the cigar very much, but the overall experience was lacking. I can only hope that my box was, as I said, an anomaly. Nonetheless, I can give this Casa Fernandez only three stogies out of five. appreciate your comments and reviews. I always use your archives as a guide before buying new cigars.But I have to say that to give a rating of four to a smoke in this price range that has these types of issues I find incredible. That appears to be a computer glitch. As you can see from the final graf, I gave the cigar 3 stogies. We’ll see about getting it fixed. This was entirely my fault. It has been fixed. Apologies. I’m sorry to hear about your experience with these. I have a box of the lanceros and love them. However, I have had experiences similar to yours with other reputable brands. Its likely just an anomaly of handcraft. At any rate, I’m glad your reviews are objective and honest. Cheers.